Every person has a preferred style to handle conflicts.This tool will help participants understand the 5 conflict management styles through their meanings, pros, cons and examples using a Market where meanings, pros, cons and examples are sold. Trainer to read "Conflict Management Styles" document as Background Information. Trainers starts with a brief introduction explaining that people handle conflicts differently and that there are 5 different conflict management styles. In addition, each situation might require a different style. Then he explains that this workshop will explain the different styles, and will allow participants to do a self evaluation which will reveal the style mostly used by each one to handle conflicts, and this is the first step which will help us to handle conflicts differently in the future. Trainer after that names the 5 styles by showing the pre-prepared FLIP CHART and explains that each style has a MEANING, a PRO, a CON and an EXAMPLE and these will be sold to the trainer by the participants themselves. 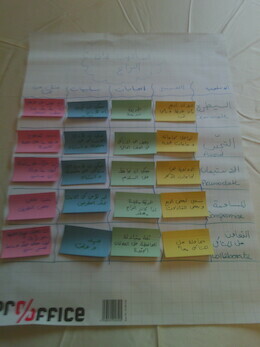 After that participants will be divided into 4 groups, each representing a market as per the "CONFLICT STYLES MARKETS". So group 1 will be the MEANINGS MARKET and will be given the BLUE SET OF CARDS. Trainer will then name a conflict style and will ask each market to sell him the corresponding meaning, pro, con and example and before sticking it on the FLIP CHART, other participants can agree or disagree if this is the true meaning, pro, con or example. Trainer will correct at the end before sticking the right info on flip chart. After this exercise, Trainer will explain in detail each style using the CONFLICT STYLES CHART document and the background info from the CONFLICT MANAGEMENT STYLES document.